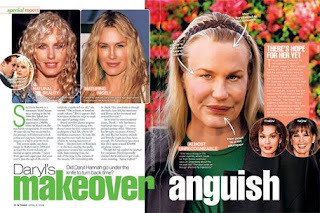 Celebrity Cosmetic Surgery: Daryl Hannah - Plastic Surgery? My question is, why do so many celebrities, who have tons of money to spend on using the best cosmetic surgeons and procedures available, end up looking at best plastic and immobile, and at worst, disfigured? It is not a very good advertisement for the industry. My god, what has she done???? She was so beautiful! Why do people, or the doctors who work on them, think that raised brows look youthful? I see lots of young people with low-slung brows. Same thing with cheeks, there are lots of young people with hardly any cheek prominence. This whole cosmetic procedure trend is getting ridiculous. Perfectly beautiful people are ruining their faces by making major changes. The pressure on women in her industry to look young is really awful. I saw her in a great documentary called Searching for Debra Winger about how there are so few roles for women as they get older that some like Debra Winger just end their careers at 39. Men, on the other hand, get character roles where they can look awful but it's okay. I hope the work she had done improves. This is the problem with having work done, it's part science and part art. And the proportions of beauty are so precise even with an unusual beauty like Hannah. The bad thing is that even after plastic surgery, a 40- or 50-something actresses are STILL not going to get the leading lady lust interest roles they had during their starlet years. I think it's going to happen to men soon. We're witnessing a great pathological shift from accepting men as they are to now insisting that they do as much as women have classically done to "improve" their looks, and more and more attention is now paid to young male stars. Clooney is out, Pattenson is in. Actually a filler like silicone, when used properly, can produce excellent results. A friend of mine had micro droplet silicone injections for acne scars, and looks fantastic. Daryl, on the other hand, looks over filled.